A warm welcome awaits at this elegant villa, built in the 1880s and located in the heart of Lynton. Named after Queen Victoria ‘s children and grandchildren, and reflecting the style of the period, bedrooms are decorated in rich colours and feature coronets, halftester and four-poster beds. 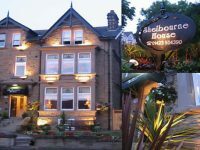 Located just a short walk south from Victoria station, this establishment is a good base for visiting the capital ‘s attractions. All bedrooms and public areas are smartly appointed and offer very good levels of comfort. An extensive continental breakfast is served. 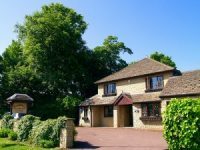 Situated in a leafy avenue close to the northern ring road and Summertown, this well-maintained house offers comfortable, well-equipped bedrooms and a relaxed atmosphere. Enjoy a traditional, hearty breakfast with vegetarian choice, including home-made muesli and fresh fruit, served in the bright attractive dining room. 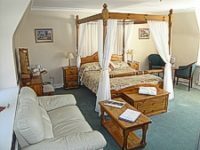 located in the centre of Tamworth, this popular inn provides well-equipped and pleasantly decorated accommodation. 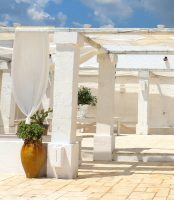 The public areas include a spacious lounge bar and a relaxed dining area where a varied selection of dishes is available. There is also a function room and adjacent parking. Expect a friendly welcome at this family-run guest house situated opposite Ferncliff Gardens and within walking distance of the town centre and seafront. A full English breakfast is served in the dining room overlooking the sun terrace. Enjoy a drink in the bar/lounge. Dinner by arrangement. Occupying a prominent corner position, this property mixes traditional values with a trendy and artistic style. Bedrooms are thoughtfully equipped, individually furnished and have bright colour schemes, but it is the delightful dining room with corner bar, and a wall adorned with clocks that catch the eye. Set in its own grounds, guests are assured of a warm welcome at this young family’s home. Bedrooms are comfortable and well equipped, the majority overlooking the gardens to the front of the property. Home-cooked evening meals are a highlight and use the best of local produce, prepared with care and skill. located on the edge of Uttoxeter and close to the racecourse, High View Cottage offers comfortable, wellequipped accommodation and a friendly atmosphere. Bedrooms are equipped with lots of thoughtful extras, and hearty breakfasts are served in the attractive Garden Room which overlooks the courtyard. The saying ‘small is beautiful’ aptly applies to this guest accommodation. Set in the main street the careful renovation of its Victorian origins transports guests back in time. Cosy public rooms are ideal for conversation, but there are masses of books for those just wishing to relax. The stylish, individual bedrooms match the character of the house but are thoughtfully equipped to include DVD players. 2 Quail was a Finalist in the AA Friendliest B&8 of the Year Award 2012-13.